So, you’re thinking about converting your gas fueled car into a cleaner, cheaper electric variety, but you’re worried that it’s going to be too difficult? Well don’t be. Building an electric car isn’t as hard as you might think. It’s not trivial, but if you can manage an oil change without taking your car in to an auto shop, then you won’t have too much trouble. There are just a few simple steps to follow, and before you know it, you’ll be cruising around in your new electric car. First, do your research. 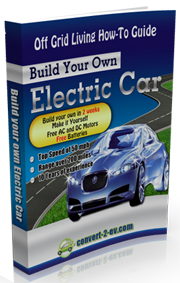 It sounds obvious, but you should try find out everything you can about building electric cars before you begin. Learn online, there are a lot of great resources on the Internet, and keep a blog of your efforts. Someone will appreciate learning from your experience, and the comments can be a great source of advice. Do beware though, not everyone online knows what they are talking about. Secondly, get an expert who has done it before to give you a hand if at all possible. They can help you plan the project, and avoid all the common mistakes. Try your local Electric Auto Association to find some help. Thirdly, set up a decent workspace. It should be well lit, clean, dry, and heated. Also, make sure it’s available to you for a good amount of time. While the mechanical side of things may go quite quickly (especially if you have an expert helping you), you never know when that crucial part might get caught up by customs and be delayed, or end up shipped to the wrong address (even the wrong city, in which case you’re in for quite a wait). On the subject of deliveries, make sure to set up a regular delivery schedule for your parts. If you’re only working on your new electric car in the weekends, you probably don’t want all the conversion parts sitting around the whole time. Get your expert to help you divide the project up into manageable pieces. Next you need an ordinary car to dismantle. It’s also a wise move to pick up an electric vehicle conversion kit, rather than try to acquire all the parts separately. If you do, then setting up a regular delivery schedule is no longer necessary, since you’ll be receiving everything at once. Since chances are you’re not a machinist, you’re going to need to make friends with one. Parts of the car, such as the transmission adapter plate and the assembly that fits the motor to the transmission are going to require high quality machining work. While on the subject of outsourcing work, get your local auto repair shop to remove the engine for you. They have the experience and tools required for removing heavy engines. It only costs a few hundred dollars, and it’s far better than trying to do it yourself. Simple enough steps to follow, and with a little time and patience, you can replace your gas guzzler with a nice clean electric car, and gain a bit of mechanical expertise to boot. If you are a total newbie on Do It Yourself (DIY) electric car conversion project, it is a good idea you begin by getting yourself familiarized with the nature of EV retrofitting. Start by doing some reading. Check out the Convert2EV ebook by Les Oke. Throughout the years, Oke from Canada has converted numerous conventional automobiles to pure electric car. The Convert2EV ebook was written so even the non-techie could understand it. Click on the link below to see what the EV conversion guide has to offer.